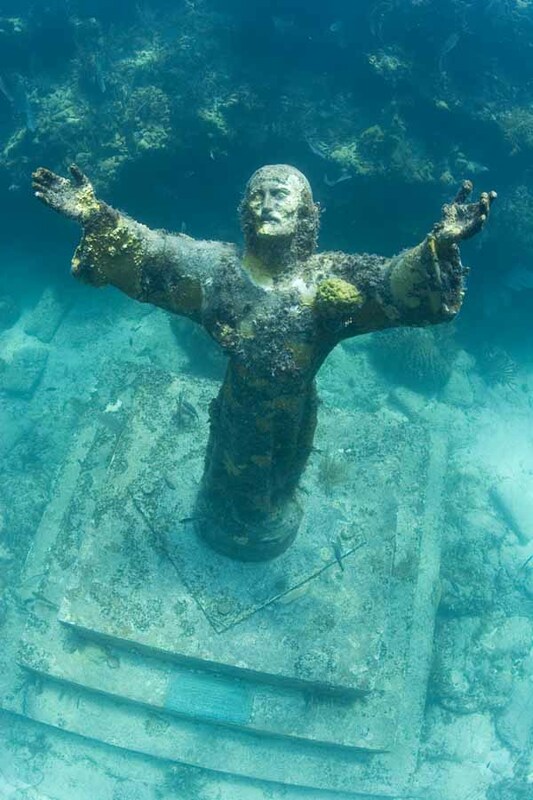 Posted here is the Christ of the Abyss statue in Key Largo, Florida. It is a 11 foot tall bronze statue that rest in about 25 feet of water. I, personally, visited this amazing statue in the summer of 2013 but unfortunately my pictures have been misplaced. The most accurate word to describe this site is, breathtaking. This notoriously popular dive site for natives and tourist was established in 1965 and has been a symbol of peace and safety since then. It is said that the Christ of the Abyss watches over the waters of the Keys. I fell in love with this statue the moment I saw it. I am a Christian, so, this being the case, it meant a great deal and become something that I saw as credible and impressive. Being able to have a lifelike, tangible monument allows people to depend and believe further into their relationship the Christ. Every time that I have the chance to be in the area of the Christ of the Abyss, I make a point to visit it because of its role it plays in the waters of South Florida. Sidenote- Over 25 underwater weddings have taken place at the Chirst of the Abyss.